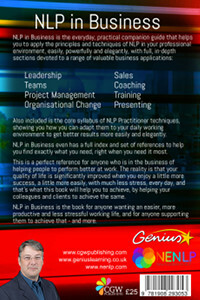 NLP in Business is the everyday, practical companion guide that helps you to apply the principles and techniques of NLP in your professional environment, easily, powerfully and elegantly, with full, in-depth sections devoted to a range of valuable business applications. Also included is the core syllabus of NLP Practitioner techniques, showing you how you can adapt them to your daily working environment to get better results more easily and elegantly. NLP in Business even has a full index and set of references to help you find exactly what you need, right when you need it most. This is a perfect reference for anyone who is in the business of helping people to perform better at work. The reality is that your quality of life is significantly improved when you enjoy a little more success, a little more easily, with much less stress, every day, and that's what this book will help you to achieve, by helping your colleagues and clients to achieve the same. NLP in Business is the book for anyone wanting an easier, more productive and less stressful working life, and for anyone supporting them to achieve that - and more.